On 7 April 1997 Astro-Physics announced the introduction of the new two inch diameter "Maxbright" mirror diagonal - a dramatic step forward in the evolution of mirror diagonals. 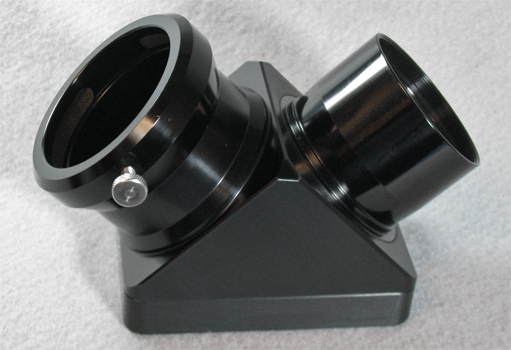 A "Zenith Mirror" (or "diagonal") accessory is designed to provide a comfortable viewing position for the observer by diverting the image at the rear of the telescope off axis by 90 degrees to the side, all with minimal degradation of image quality. The "Maxbright" diagonal incorporates several features unprecedented in our industry to provide optimum performance and years of use. Left: Astro-Physics Maxbright 2 inch Diagonal. Note non marring brass clamp/set screw arrangement (12,493 bytes). Dielectric Coatings: The Astro-Physics 2" diagonal mirror has a very high-tech dielectric coating that was developed originally for military optics used in hostile environments such as blowing desert sand. There is no aluminum or other reflective metal used. The reflective surface consists of 52 layers of thin film oxides, similar to those used in antireflection coatings. The coatings are deposited by an electron beam evaporator at a high temperature. Use of a dialectic coated mirror diagonal with heated accessories such as the DayStar University and ATM series Hydrogen-Alpha Filters will necessitate an increase of the filter operating temperature setting because the coatings of these diagonals do block infrared energy. Reflectivity: Reflectivity is above 99% over the entire 4000 to 7000 photo-visual range. Thin film coatings have extremely low surface scatter compared to aluminum or enhanced aluminum coatings; examination with a laser source shows approximately a five fold reduction of surface scatter over conventional coatings. Durability: The coating is extremely durable compared to metal coatings and can be cleaned repeatedly. Brass Locking Ring: Our customers have appreciated the non-marring benefit of the brass locking ring on our Astro-Physics telescope reducing adapters, and on our Astro-Physics 2" Barlow; they have urged have urged development of a diagonal with this feature. The recessed brass ring is under the thumbscrew location, so as you tighten the thumbscrew, the brass locking ring clamps onto your eyepiece. This provides a more secure grip for your expensive eyepieces than the head of a single screw can provide. As an added advantage, the brass will not mar the surface of your accessories as simpler set screws do. Baffled Flat Black Interior: The interior is fully antireflection machine threaded and then finished with a low reflection coating reduce any possibility of undesired internal reflection that might be visible in the form of ghosting. This helps to allow maximal light transmission. Threaded for 48mm Filters: If you thread your filters directly into the field barrel of the diagonal, then you can change eyepieces with ease without handling the filter. Furthermore, when employed with a 2" to 1.25" reducer then one standard filter becomes useable with all your visual oculars. Engraved: The "Astro-Physics" trademark, and the product description "MAXBRIGHT" are tastefully and permanently engraved into the black anodized exterior. The result is lettering in a natural aluminum. Made in the USA: The diagonal mirror elements are made in the USA by Astro-Physics coating subcontractor, the mechanics are made at the Astro-Physics factory. These components are then hand assembled by Roland Christen and tested in a controlled environment to assure perfection. 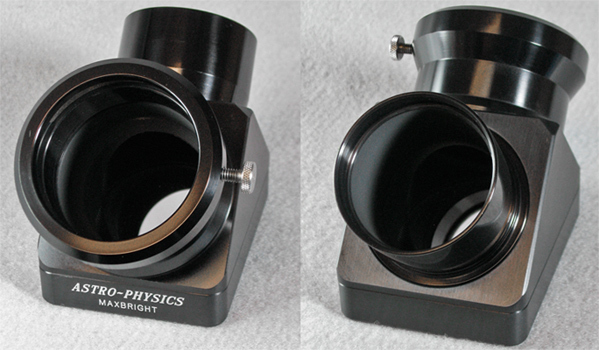 Above: Astro-Physics Maxbright 2" Mirror Diagonal side (35,979 bytes) and end views (45,624 bytes). From Company Seven display. Click on image to see enlarged view (95,865 and 125,820 bytes). "The elements are oversized and thick enough so that the end result is a highly accurate reflective surface over the clear aperture that is actually used with any kind of telescope. I personally assemble and test every diagonal under controlled conditions to assure that there is no detectable error of a perfect star image at very high powers. Measurements that I have made using interferometer techniques show that over the clear aperture of an F4.8 telescope, the flatness runs typically 1/40 wave, and I will guarantee at least 1/20 wave. This is not a flatness measure of the entire surface, just that part of the surface that is actually used to form an image of any particular star anywhere in the field of view. I've been in this business long enough to know what is important for each optical element in the optical train, and how these should be designed, specified and constructed to perform at their peak. I will not sell any accessory that would diminish the performance of our basic telescopes. In the case of a star diagonal, what is most important is that the surface polish quality be very high (very deep polish with no remnant pits or subsurface damage to cause scatter), and very high quality low scatter coatings. These will insure highest image contrast with lowest scattering. Surface wavefront is also important, but the only effect of that is to introduce astigmatism into the image. A diagonal mirror cannot cause any other image defect. Astigmatism is very easy to detect, and I do test each and every mirror at very high power to insure that the star image seen through each Maxbright will be perfectly round. There is nothing more that you can expect from a star diagonal. Arguments have been made that certain low expansion materials are required for best performance in star diagonals, but this has no basis in fact. For an optical element close to focus, having a zero expansion material has no effect whatsoever on final image quality. In fact, if you examine any eyepiece or Barlow lens, you will find all kinds of different glass materials in them that have very high thermal expansion coefficients, with nary an effect on image quality. If thermal expansion were an issue, then all eyepieces and Barlows would need to be made of quartz or Zerodur®, but in fact none ever has been. Thermal expansion also has no effect on cool down. The two effects are unrelated. The proprietary material we use is is low expansion, but not zero expansion type. It is not cheap common glass. It was chosen for its hard surface qualities and specifically to allow the manufacturer to achieve the excellent polish that we require. The material is being used in countless large diameter professional astronomical mirrors. It will not deform or produce unwanted image defects under any kind of temperature extremes. You may refer to our Library for the article Cleaning Most Consumer Optics a short illustrated "how to" including a "flow-chart" with discussion of particle removing techniques, brushes, and solvents. Remove the four stainless steel screws holding the mirror housing to the back of the diagonal body. Do not remove the mirror from its aluminum housing. Blow any large, loose bits of foreign matter from the surface of the mirror with an air bulb. Stubborn particles can usually be removed with a soft camel's hair brush such as our Staticmaster Brush. To remove contaminants such as finger prints or eyelash oils, place a few drops of an approved lens cleaning solution such as those made by Kodak, Carl Zeiss, etc. onto a natural cotton swab. Alternatively, you may place a few drops of a mild soap solution of dish washing liquid diluted with water to make a safe solvent. Make certain the cotton swab is damp but not dripping wet. It is advisable to use soft cotton swabs or white facial tissue and little or no pressure. Gently hold the swab so that it is just touching the mirror surface - surface adhesion should do the rest. Now wipe in a circular motion toward the outside of the mirror. Although these are hard coatings, they can be damaged by hard rubbing if there are tiny abrasive dirt particles on the glass. If necessary you may follow immediately with a denatured alcohol wetted tissue and a final swipe with an acetone wetted tissue (removes stains). The acetone (or use of the Staticmaster Brush) also leaves the surface in an antistatic state which will help to prevent dust attraction. Finally, residual bits of dust or cotton can be blown off with an air bulb. Protect "Maxbright" from shock, vibration, dust and dirt. When not in use, store in a padded case. Keep covers in place. Remember that these coatings are significantly more durable than aluminum, enhanced aluminum or silver coatings, however they are not indestructible. Phase use common sense when cleaning.